An Edison Direct Current 6 kilowatt, 125-volt, bipolar dynamo/generator comes alive in the Edmonton Power Historical Foundation (ephf.ca) Museum. We restored a vintage 1890 Edison dynamo which now runs as a direct current electric motor. the field coils were wrapped with manila rope. The base, frame, and wood terminal boards were refurbished and painted. To display the dynamo running at slow speed (0-150 rpm), a PWM speed controller powered by a 12-volt battery was connected. Two vintage voltmeters, an ammeter and two switches were incorporated into the display. A timer circuit stops the unit after a 40 second run. Visitors seem to enjoy starting the unit with the vintage switch, watching the armature slowly accelerating to 60 to 85 rpm. 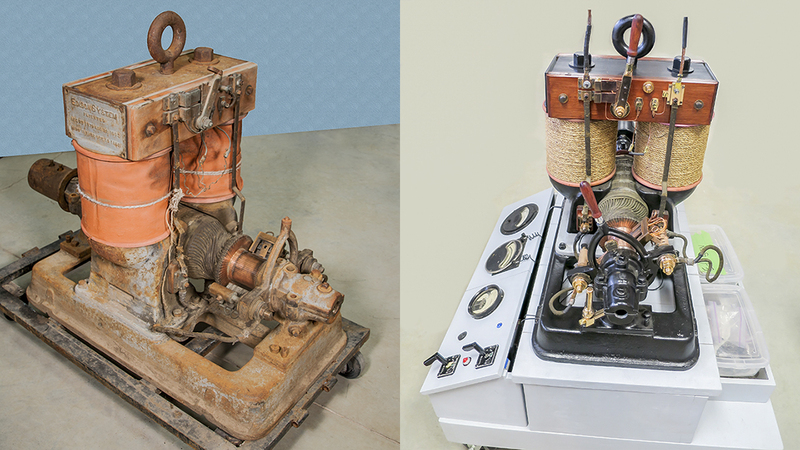 This Edison Bipolar Dynamo (direct current generator) arrived at the museum in October 2014, from Grand Forks B.C.